Welcome to GO BIG! | UC Berkeley Student Affairs Community Blog! What drives culture? What is my role? Leaders of great workplace culture live it and see it as a strategic driver. It makes your organization a place where people want to work and where students want to thrive! Managers and supervisors have huge influence and impact over the environment created. How are you raising the positive for someone in the moment? What exactly is this “happiness advantage?” Psychologist and researcher Shawn Achor shares how each person has the power to shift this! Here’s one thing from Shawn Achor’s TED talk that you can do starting today: during a staff meeting, ask your team about a small moment of happiness they experienced that day. You can then brainstorm as a team of how to create small moments of happiness in the workplace for each other. If we raise the level of positives in the present, research has shown that people perform better, energy rises, and business outcomes improve. 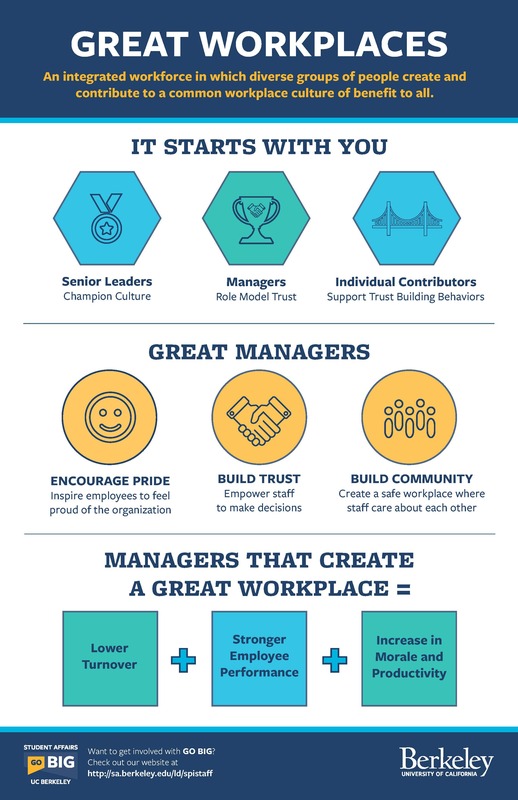 Finally, check out our first infographic and how a great workplace starts with you. We hope that this blog will illustrate that doing things differently can lead us to an awesome culture that will create amazing experiences for our students at UC Berkeley.